High quality hygiene brushes, supplied in hygiene colours allowing the implementation of colour coded systems to prevent cross contamination. High quality hygiene broom manufactured to 'food safe' standards. 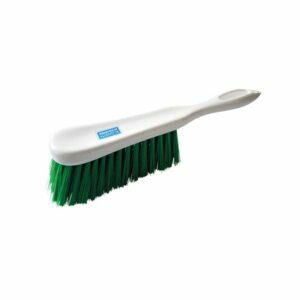 This medium sweeping broom is ideal for collecting larger particles on smooth floors and is also autoclavable allowing the brush to be easily cleaned at high temperatures. Available in 4 colours allowing the implementation of colour coded systems to prevent cross contamination. High quality hygiene broom manufactured to 'food safe' standards. 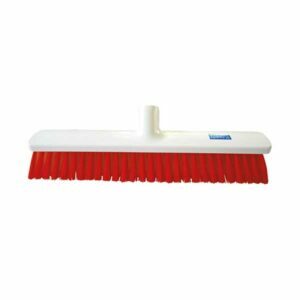 This soft sweeping broom is ideal for collecting fine particles and debris and is also autoclavable allowing the brush to be easily cleaned at high temperatures. Available in 4 colours allowing the implementation of colour coded systems to prevent cross contamination. High quality hygiene broom manufactured to 'food safe' standards. 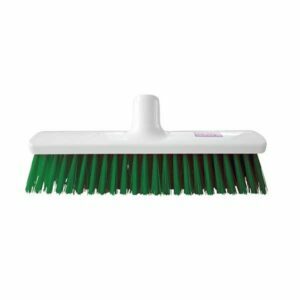 This stiff sweeping broom is ideal for sweeping rough surfaces and collecting larger particles. The broom is autoclavable allowing the brush to be easily cleaned at high temperatures. Available in 4 colours allowing the implementation of colour coded systems to prevent cross contamination. 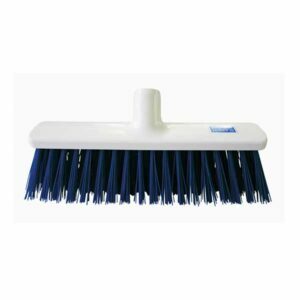 Quality hygiene scrubbing broom manufactured to 'food safe' standards. 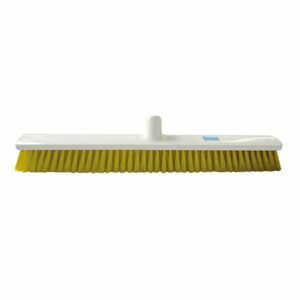 This broom is ideal scrubbing surfaces and also tiled floors. The broom is certified as food safe in addition to being autoclavable, allowing the brush to be easily cleaned at high temperatures. Available in 4 colours allowing the implementation of colour coded systems to prevent cross contamination. High quality hygiene broom manufactured to 'food safe' standards. 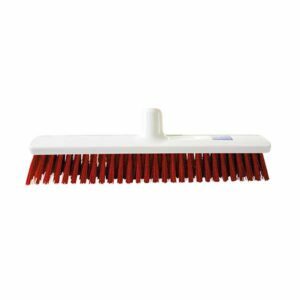 This medium sweeping broom is ideal for collecting larger particles on smooth floors and is autoclavable allowing the brush to be easily cleaned at high temperatures. Available in 4 colours allowing the implementation of colour coded systems to prevent cross contamination. 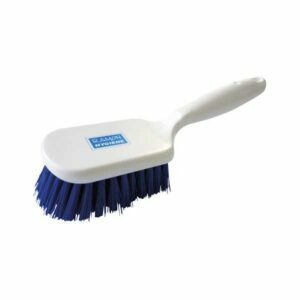 High quality hygiene broom manufactured to 'food safe' standards. 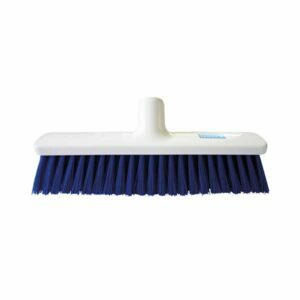 This soft sweeping broom is ideal for collecting fine particles and debris and is autoclavable allowing the brush to be easily cleaned at high temperatures. Available in 4 colours allowing the implementation of colour coded systems to prevent cross contamination. 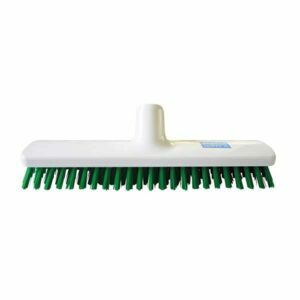 An extra large hygiene sweeping broom manufactured to 'food safe' standards in which also features both soft & medium filaments to suit all floor cleaning tasks. The broom is is autoclavable allowing the brush to be easily cleaned at high temperatures. Available in 4 colours allowing the implementation of colour coded systems to prevent cross contamination. 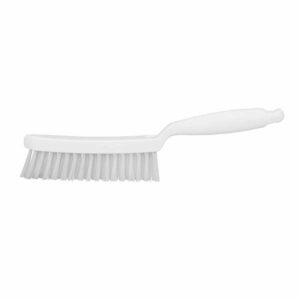 Suitable for brushing larger particles, this brush is certified as food safe and is also autoclavable. Available in all 4 hygiene colours allowing the implementation of colour coding systems to prevent cross contamination. High quality autoclavable nail brush. Available in the 4 hygiene colours allowing for the implementation of colour coded systems to help prevent cross contamination. 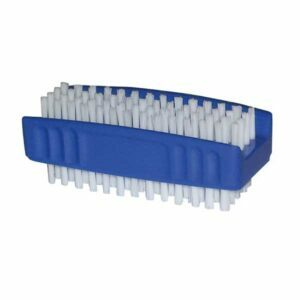 Double sided nail brush which is available in blue and white, supplied in inner packs of 10. 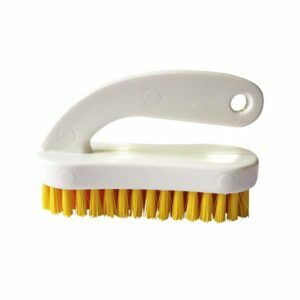 Specially designed for cleaning commercial saucepans, sinks, baking trays etc. The brush is certified as food safe and in fact autoclavable. Available in blue as standard, but can be supplied with red, yellow and also green bristles on demand.